Regardless of whether you publish your audiobook or want a publisher to do it, the first thing you need to do is ensure you have the audio rights to your book. You will take this step regardless of the publishing platform you choose to use, i.e., ACX, Findaway Voices, Spoken Realms, etc. If you published traditionally, you should carefully check your contract. You may have unknowingly assigned your audio rights to the publisher. In that case, you should assess whether the rights are automatically returned to you after a certain period of time. I encourage you to ask the publisher about any plans for audiobook production. You can (and should!) request that the publisher revert the audio rights to you if they do not intend to exercise those rights. Many authors have been successful in reclaiming their audio rights in this manner. The links in this article will help you determine the rights holder and give you more info about rights reversion. You may also need to address a second rights issue before you can start audiobook production. Authors sometimes include lyrics from contemporary songs in their text after obtaining permission from the lyric copyright owner. However, lyric reprint permission does not extend to the audiobook! In fact, an audiobook narrator can’t sing or even speak copyrighted song lyrics in the recording unless you first obtain a mechanical license, and, if singing is required, performance rights to the song. Otherwise, you would need to modify your text so that your story works without the copyrighted material. You may need to write some descriptions for images and/or create a companion PDF of any material that the listener needs in order to fully understand the text. This site has instructions for creating a PDF. You can then follow these instructions to send the PDF to ACX so it can accompany the audiobook purchase. Furthermore, it’s a good idea to reformat your text by removing sidebars and inserting those passages in logical places within the text so your narrator can easily follow the correct flow of your ideas. With your rights and properly formatted text in hand, you’re ready to start the independent production process by creating a book listing on ACX.com. Audible.com, the largest retailer of audiobooks, launched ACX in 2011 as the first matchmaker site where professionals connect to create more audiobooks for Audible’s growing number of listeners. Unlike dating sites, ACX is free to use and offers authors, literary agents, and publishers (aka, rights holders, or RHs) an excellent way to connect directly with audiobook narrators and producers. Completed audiobooks are automatically distributed to the 3 biggest sites for audiobook sales: Amazon, Audible, and iTunes. Amazon owns Audible, which owns ACX. Audible is the exclusive audiobook supplier to iTunes, and you already know about Amazon’s publishing clout. In addition, ACX has a well-established process, an incredible talent pool, and a track record of over 100,000 completed audiobooks. Signing on to ACX is easy as you’ll use your Amazon login and password. As an RH in the US, UK, Ireland, or Canada, your only requirement to start production on ACX is that you have an edition of your book listed on Amazon. It doesn’t matter whether the edition is hardbound, paperback, or Kindle as long as one edition is there. Unfortunately, ACX is not currently available to rights holders in other countries. I will present other options in future articles. A detailed tutorial for using ACX is beyond the scope of this column, but many helpful instructions exist on-line, including this terrific tutorial with screenshots. I also refer you to my previous article How to Avoid 3 Costly Mistakes on ACX. In our remaining time together today, I want to talk about 5 key factors your ACX title profile needs to attract quality auditions for your title. 1. Pick the edition with the best (lowest number) Amazon sales rank. The first step in ACX production after login is to claim your title from the list of your books on Amazon. If you have multiple editions of the same book, you want to claim the one with the best Amazon sales rank. The sales rank is a vital piece of information for royalty share (RS) projects, which we’ll look at in a moment. Enter the ASIN of the best performing edition in the ACX search box instead of your name. Your finished audiobook will be added as another edition on the book’s Amazon product page. 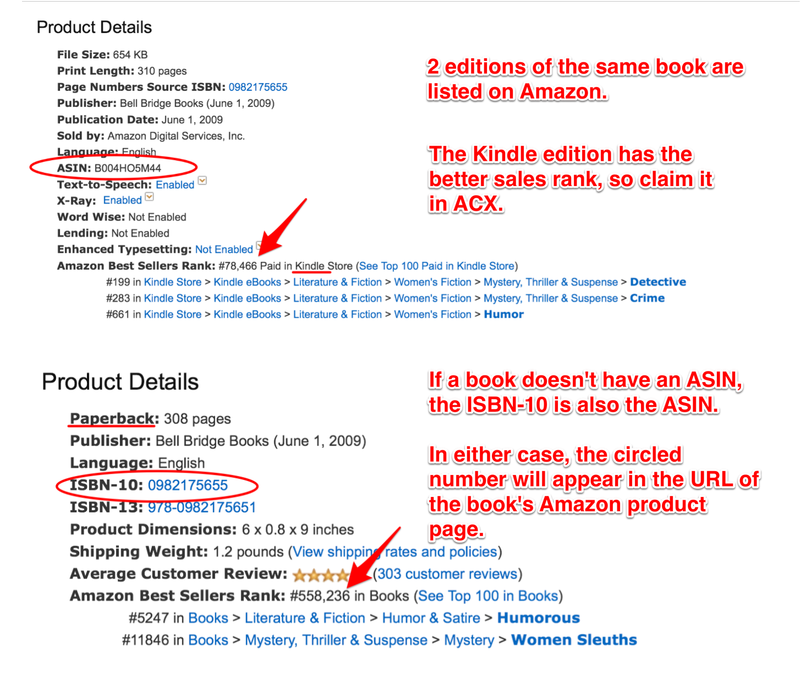 The annotated picture below shows you where to look on the Amazon page for your ASINs and sales ranks for each edition. In the example, the Kindle edition has a sales rank of 78,466, whereas the paperback of the same book has 558,236 as its sales rank. These numbers indicate that the Kindle version is bought more frequently than the paperback. You would want to use the ASIN from the Kindle edition when claiming your book on ACX. 2. Consider the pros and cons for exclusive vs. non-exclusive distribution before selecting one. Under both options, your audiobook will be sold via digital download on Amazon, Audible, and iTunes for a 7-year term. However, your distribution choice will dictate your payment options for the production costs and your royalty rates. • Your royalty rate is currently 40% of revenues. • You may choose to pay a one-time fee up-front for production (a per finished hour, or PFH, rate) and retain all 40% in royalties. • You also have a royalty share (RS) option, which allows you to defer your production costs throughout the 7 years by offering a RS contract where the narrator is paid out of the revenues from the audiobook royalties. You each would receive 20% in royalties. • You are prohibited from making the audiobook available to libraries, bookstores, or schools and you cannot sell it on CD. 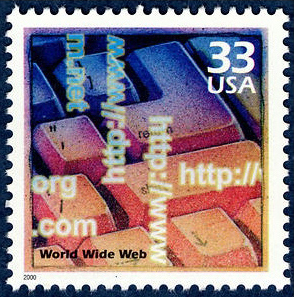 • Your royalty rate is currently 25% of revenues. • You must pay PFH rates up-front for the production costs, or you already have audio that meets ACX’s recording specifications and is ready to upload. • You do not have the RS payment option. • You’re allowed to offer the audiobook for sale at other on-line or physical retailers and/or on CD. You could submit it to services like Overdrive.com for potential library distribution. The additional information in this article will help you make this critical decision. If you choose the wrong distribution option, you can’t change it without emailing ACX Support to delete this listing so you can create a new one. 3. Enter a book description and rights holder comments that generate excitement. ACX estimates the finished time by dividing 9300 average words spoken in an hour into the word count of the text. You should be aware that the rule of thumb is that 6 hours are needed to produce each finished hour of an audiobook. A 10-hour audiobook therefore requires around 60 or more hours of work. If you decide on a royalty share (RS) contract, you need to be aware that a narrator has all of the risk for low or no sales of the audiobook. As a result, the most experienced narrators may not be interested in auditioning for, much less performing, your book. Fill out this area of your profile with enough solid information that makes the narrator interested in your story and convinces her that the long-term royalties will recoup her narration fee and her production costs. A solid marketing plan is essential to achieve sales, especially for RS projects. Your numbers of social media followers on various sites may not impress narrators unless you are a celebrity or have numbers in at least 5 figures. Even then, if you haven’t studied marketing tactics for each site, how will you convey to a narrator that you know how to sell books on that platform? Also include information about the awards that you have won and your specific marketing and promotional plans for this book and the new audiobook. The system will automatically link to your Amazon book page and fill in your Amazon rating average and sales rank. A narrator is much more enthused about a sales rank of 40,000 than 4,000,000. If the posted edition isn’t selling, the audiobook probably won’t sell, either. Now you know why I advised you about the sales rank in item 1! 4. Be ready to upload visually-pleasing cover art. Just like in Internet dating, the picture on your profile is the first thing Mr. and Ms. Narrator see about your title. We definitely judge a book by its cover! If you don’t post a compelling cover for your book, you may not receive many auditions. In addition, your cover art needs to meet Audible’s requirements for a perfectly squared off, proportional image. You may need to pay a designer to create the ideal cover for your audiobook. Remember, too, that traditional publishers own the copyright to their cover designs. You may be able to license yours for the audiobook, but you should finalize those arrangements before you post your title on ACX. 5. Choose your audition scenes carefully. Authors commonly post either the first few pages or the entire book as the audition text. Neither may serve your best interest! The first few pages may not include the main characters. Narrators don’t have time to read your entire book or understand the arc or relationships before submitting an audition. Coffee meetings serve as first dates. Likewise, finished auditions also quick and usually last no more than 5 minutes. Therefore, you should post an audition of 2-3 pages that contains both narrative and some dialogue between the main 2-4 characters. You may need to choose more than 1 scene from different parts of the book. Character descriptions and scene set-ups are appreciated. Next Wednesday, we’ll look at the rest of the ACX process, from casting the narrator you love to living happily ever after with the audiobook. In the meantime, please leave me any questions and comments below. The original version of this article appeared in the October 2015 issue of InD’tale Magazine. I’ve updated it and added more links. Thanks for this article, Karen! What’s the workaround for 2 narrators in Royalty Share? Hi, Parker! Thanks for the note. I wouldn’t take a Royalty Share (RS) contract with another narrator to whom I’m not married. On ACX, the narrator only receives 20% of the royalties on those arrangements, so splitting that 20% to 10% usually means that each narrator will not earn out their fees from the royalties. It CAN be done even though I wouldn’t advise it. On ACX, one narrator would accept the contract from the Rights Holder (RH) and then have a separate contract outside the system with the other narrator. The narrator under contract on ACX then must pay the 10% of royalties to the other narrator. The RH could instead choose to distribute via Spoken Realms, which has a built-in process for multiple narrators on a royalty share contract. You might want to read this article and its comments for more details about the complexity of recording these types of projects.